Background: Mangiferin, was identified in the crude methanol extract, ethyl acetate, and n-butanol fractions of Aphloia theiformis (Vahl.) Benn. Objective: This study aimed to analyze the plausible binding modes of mangiferin to key enzymes linked to diabetes type 2 (DT2), obesity, hypertension, Alzheimer’s disease, and urolithiasis using molecular docking. Method: Crystallographic structures of α-amylase, α-glucosidase, glycogen phosphorylase (GP), pancreatic lipase, cholesterol esterase (CEase), angiotensin-I-converting enzyme (ACE), acetyl cholinesterase (AChE), and urease available on the Protein Databank database were docked to mangiferin using Gold 6.0 software. Results: We showed that mangiferin bound to all enzymes by π-π and hydrogen bonds mostly. 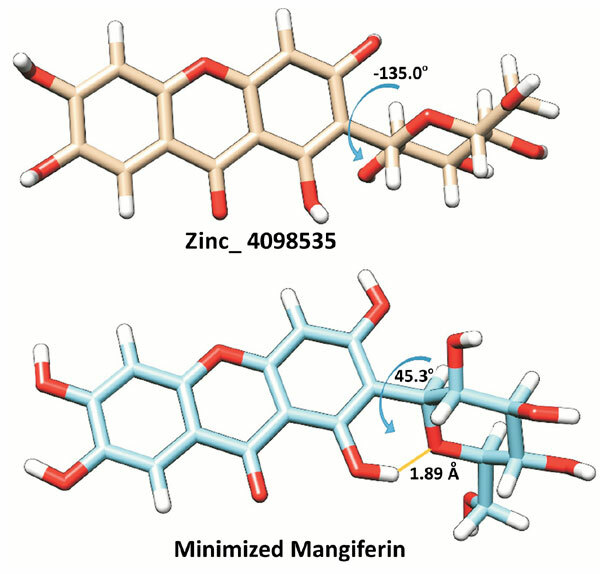 Mangiferin was docked to both allosteric and orthosteric sites of α-glucosidase by π-π interactions. However, several hydrogen bonds were observed at the orthosteric position, suggesting a preference for this site. The docking of mangiferin on AChE with the catalytic pocket occupied by paraoxon could be attributed to π-π stacking involving amino acid residues, Trp341 and Trp124. Conclusion: This study provided an insight of the molecular interaction of mangiferin with the studied enzymes and can be considered as a valuable tool for designing new drugs for better management of these diseases. Aphloia theiformis, diabetes type 2, mangiferin, molecular docking, natural enzyme inhibitor, obesity.